When we started the podcast a year ago, on July 20th, it was to commemorate that day with a beautiful remembrance of Bruce Lee and the gifts that he left behind for all of us. The podcast format allows us to discuss Bruce Lee’s philosophy more in-depth and share his legacy with everyone for free. At the live event Shannon debuted a new short film called “One Family”where her mom describes how in 1964 Bruce was challenged to a fight that, although he won, changed his perspective and approach to martial arts and his life. Special guest Osric Chau joined us for the event and shared his experiences completing the Bruce Lee Podcast Challenge, shared his thoughts on Bruce Lee, and gave an #AAHA shout-out. Osric Chau was born in Vancouver, his father is from Hong Kong and his mother is Malaysian. He trained in Wing Chun for many years and wanted to be a stuntman, but was discovered and his first film was Kung Fu Killer (2008) with David Carradine. Since then he’s been in 2012, What Women Want, The Man with the Iron Fists, and was in recurring roles in Supernatural and now on Dirk Gently’s Holistic Detective Agency. We were lucky to have Osric join us for the evening before heading down to Comic Con in San Diego. 1) Create your own affirmations and write them down and read them aloud everyday. 2) Complete the statement “I would feel better in my body if...” and completing that action. 3) A Harmony Exercise: “Letting others be.” This was both letting other people be and letting yourself be too. We asked Osric to complete the challenge and he graciously said yes. He said this about his overall experience: “I loved it, this was probably one of my favorite things I’ve done in recent memory. It literally changed my life and I think it will continue to change my life.” He’s decided to incorporate the challenge into his life and continue doing the action items! Osric compared accomplishing these small goals like earning gold coins in a video game, and as a gamer, he found he felt a sense of accomplishment getting another “gold coin” with each task completed. This was a great observation about himself and helped motivate him during the challenge. Like most of us who did the challenge, Osric said he felt a little silly at first reading his affirmations aloud, but then by the second week he started noticing it becoming easier and more routine. He started applying his affirmations and action items with more enthusiasm, and after the 3rd week started to feel like it wasn’t a “challenge” anymore and that he liked it. He decided that it could be a part of his lifestyle and that he would continue adding to his affirmations. Part of the challenge that we all felt a little silly doing was reading our affirmations out loud and carrying them around, but remember that Bruce Lee did this too. If he can do it, we can do it! Repeating these affirmations everyday is like a mental work out, and they get easier to do the more we practice. For the “I would feel better in my body if…” action item, Osric thought at first he didn’t have anything to improve since he already eats well and exercises, but then realized he hates stretching. Realizing this is his weakness; it took Osric all week to remember to do stretches, but then after thinking about it often he found himself stretching while watching TV or doing something else. This is similar to how Bruce Lee would do his stretches, while reading or doing something else. Osric found that the stretching daily actually helped in his work on Dirk Gently, sharing that being pre-stretched really helped when performing stunts. Several months prior when he had to do a stunt he was sore for days after, but this time around it was much better. In the final action item, the Harmony Challenge, “Letting others be,” Osric thought it would be easy since he considers himself a cheerful, kind person, but then he realized how much he enjoys gossip. When sitting in the makeup trailer people enjoy gossiping and he used to join in, but during this challenge the extra awareness made him step back and not participate in the gossip. Instead of wanting to put others down, he wants to raise people up. Bruce Lee was against competition because it put people in a rival mindset, and makes you want to push somebody down rather than working on yourself to be better. Instead of participating in martial arts competitions, Bruce would go only to exhibit and demonstrate. He felt that the best way to be was to teach and to guide, to be your best self and work on yourself, to compete with yourself and let others be. Osric enjoys healthy competition to get better at his work or in martial arts because if you fail it makes you want to be better. Osric goes on to explain how he wants to cherish his failures because he knows they bring him closer to success. “The solution is in the problem.” If you fail, then you can investigate why and use that insight to move forward. We went on to discuss what it’s like to be an Asian male actor in today’s entertainment business, 44 years after Bruce Lee’s death. Osric finds it to be a really exciting time to be a part of the industry. 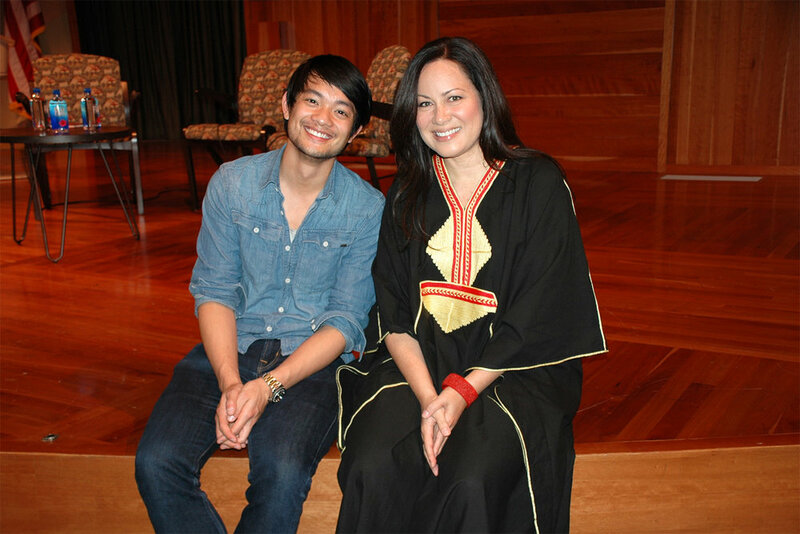 When Osric was 9-years-old his mother signed him up for a bunch of classes, and one of them was acting. There was an audition for a 9-year-old Asian actor, which didn’t exist, so they put every 9-year-old Asian kid they could find and put them in a room to play. Osric didn’t even know it was an audition! Since there was a void of Asian actors, he ended up getting representation and auditioning a ton, but never had the dream of being a leading Asian actor because there weren’t any. When things started shifting, he began to think about a larger career and that he could be one of the first lead Asian actors instead of just the “token” Asian kid. Osric has decided to continue the podcast challenge, and also wants to spread it around to everyone he knows. We did say that the grand prize is that you’d change your life! Even though Bruce Lee was not one of his idols growing up, the philosophy of Bruce really resonated with him. Osric watched an interview of Bruce talking about “Being like water,” and the idea of being able to adapt spoke to him as the superpower of humans: adaptability.“If you’re like bamboo you’ll flex in the wind, but if you’re like wood you’ll snap.” This idea of adaptability or “Be like water,” led Osric to do all these crazy things that he trusted he would just figure it out as he went. One of the things was saying yes to moving to China, not knowing anyone, not knowing Chinese, and not knowing what he would do there. He ended up being able to speak conversational Chinese by the end of his first month, and then ended up getting a part in a movie by hitting it off with the director in a bar. Thank you so much Osric for joining us for the live event and for participating in the podcast challenge. We know that just by sharing your challenge experience you’ll inspire many people out there with your vulnerability and sharing your journal and experiences. Osric’s Awesome Asian and Hapas nomination goes to Pakistani-American actor Kumail Nanjiani. Kumail is known for being on Silicon Valley and stars in the movie “The Big Sick,” (in theaters now!) which he co-wrote with his wife Emily about their relationship. It’s possibly the first movie to star a Pakistani actor in the lead role and it’s getting excellent reviews. Osric says he’s seen it once already and loved it and is thinking of seeing it again. Kumail, we think you’re awesome!